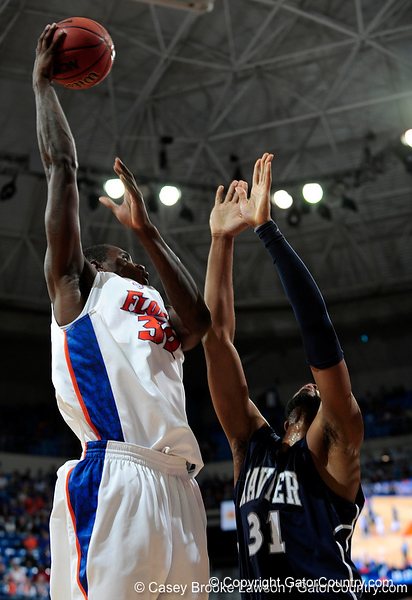 Junior forward Vernon Macklin notched his first career double-double, scoring 12 points and grabbing 10 rebounds, but the Gators’ efforts fell short to Xavier, 76-64, Saturday at the Stephen C. O’Connell Center. Florida (17-8) was led in scoring by junior forward Chandler Parsons, who contributed 15 points. Freshman guard Kenny Boynton and sophomore guard Erving Walker chipped in 12 and 11 points, respectively. Florida fell behind 38-22 with 3:52 left in the first half but rallied to tie the game at 47-47 with 13:03 left. The teams swapped the lead four times before Xavier (17-7) went ahead 54-52 with 9:20 to play on a Ken Frease jumper. From there, Xavier’s Jordan Crawford hit a three-pointer to start a scoring spree. Crawford scored 12 of his points in the second half. Most of his points came after the Gators had fought back from a 16-point deficit in the first half. Xavier’s Jason Love scored 20 points, Crawford added 18 and Frease had 12. Jamel McLean led the Musketeers with 13 rebounds.